I only have one rule when it comes to cooking. That is to keep it simple. I am not even going to pretend that I know what braising is nor am I going to try to prepare my own mussels (not anymore at least). I typically look for recipes that have 5 or fewer ingredients. Being in school while working has really forced me to be more time efficient. At the same time, I don’t really want to sacrifice my healthy habits and foodie temperament. That’s why I love this dish. It packs a punch without taking a lot of time. Kind of like marrying Kim Kardashian I would imagine. Anyways this has become a regular in my dinner rotation because of its simplicity. Season the salmon with salt and pepper. Broil in the oven for about 7 to 9 minutes. 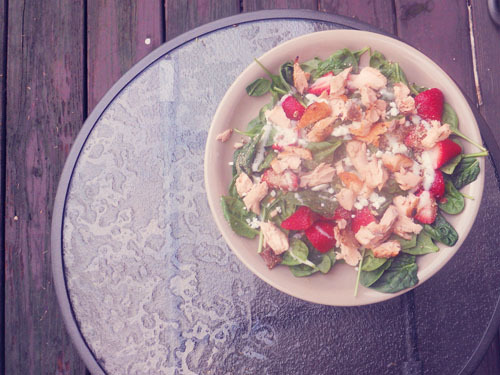 Break a part with a fork and add to spinach, strawberries, nuts and goat cheese. Voila! That’s it!